Nicaragua's main opposition party has rejected the results of last weekend's local elections which saw big wins for the governing Sandinista party. An opposition spokesman said the government's refusal to permit election observers from certain groups showed a "premeditated intention" for fraud. 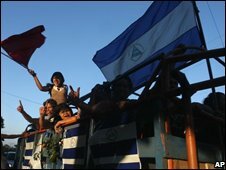 President Daniel Ortega, who returned to power in late 2006, has denied this. He has said he refused to allow the observer teams because they were backed by "outside powers". The Sandinista National Liberation Front, FSLN, won more than 90 out of 146 municipalities, while the Liberal Constitutional Party, PLC, won 46, according to official results so far. "We agreed not to accept the electoral results due to so many anomalies and irregularities," said Leonel Teller, a PLC spokesman. He said they wanted a recount by international observers, a call echoed by the Nicaraguan Bishops' Council. The head of the Organisation of American States, Jose Miguel Insulza, has expressed concern over the allegations of fraud and called on Nicaraguans to resolve the issue through dialogue. He said the presence of OAS observers would have been helpful. Ahead of the Sunday's election, President Ortega had said that the groups, both domestic and international, that would be monitoring the poll, were the most fitting for the job. The OAS as well as some domestic monitoring groups were not invited, he said, because they responded to "political interests", and the OAS was "subordinate to the US". 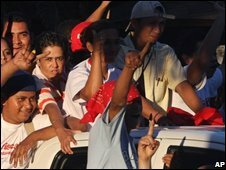 The election was seen as the first major electoral test for President Ortega since he was re-elected president in 2006, nearly two decades after leading a Marxist government that fought US-backed Contra rebels. The tension over the results has spilled into violence. There were reports that two people had died but Nicaraguan police said they had had no confirmation of this.